I started a vest for myself. I shouldn’t have, but I did. At guild on Tuesday I won a mini raffle we did, and got a 2012/2013 Bergere de France magazine. There are some GORGEOUS patterns in there, but I was taken by 2 in particular. One of them I’m not sure what yarn to use, but the other…well…it’s a fun fur vest. I know. The body is worked on 8mm needles so it’s a fast knit. It’s kinda a shrug/vest hybrid, and on Wednesday night I cast on. I finished the back ribbing and the first few rows of the body. And then I brought it to work with me on Thursday so I could photocopy the pattern out of the magazine to make it easier to work on. Now, I shouldn’t have started this project on Wed. I had realized just that morning that Christmas might be in 2 weeks, but the last day of daycare/kindergarten is next week, which means I’m running out of time to do the holiday teachers’ gifts which I haven’t started yet. I *should* have started those. But I didn’t. Which makes it only fitting that I forgot the project at work last night, and then today both boys woke up with fevers, meaning I had to keep them home, and be home all day, and NOT be able to work on the vest. Categories: Gifts, Knitting | Tags: Bergere de France, Christmas gifts, fun fur, fun fur vest, MKG, Montreal Knitting Guild, Teacher gifts | Permalink. My day ended covered in icing. Always, when I make the birthday cakes, since the parties are usually on Sundays, I bake on Thurs, dirty-ice on Fri and decorate on Sat. So today was decoration day. I knew better than to risk starting to make my buttercream while the boys were up, but I wasn’t worried about getting a late start because of how much I got done being home yesterday. In the afternoon my neighbor brought her 7-month-old daughter over for us to babysit, and my boys had a BLAST playing with her. She was seated in her Bumbo like a princess on a throne, and the boys didn’t stop parading in front of her trying to make her laugh. First Jakob would do somersaults across the room, then Henri broke in with a guitar solo, and Jakob wouldn’t be outdone, so he grabbed some maracas and got in on the performance. It was a riot. 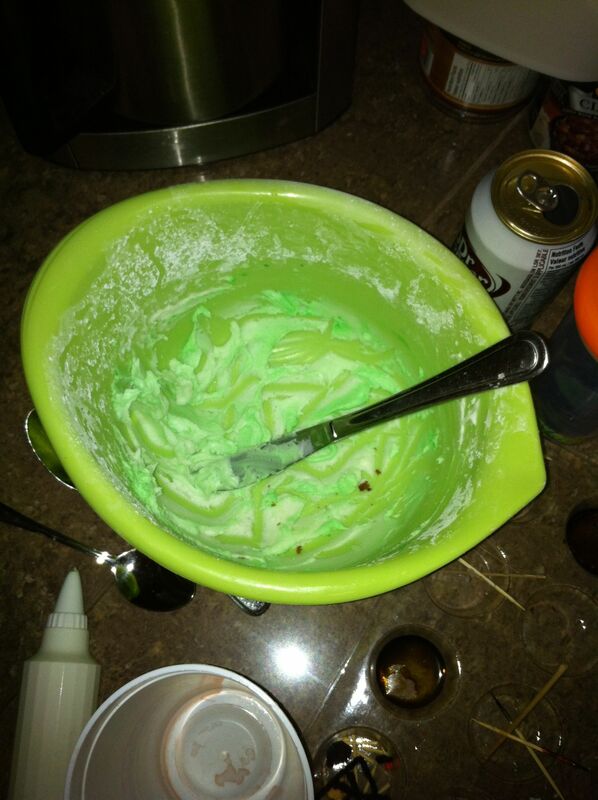 Luckily she practically put herself to sleep just before the boys went down, and I was able to get to work on the cake. But I forgot to take pics with my cell, and my camera isn’t with me at the moment, so instead of cake pics, here’s an update on the holiday gifts for the boys’ daycare teachers. This is what each teacher (5 in total) got. 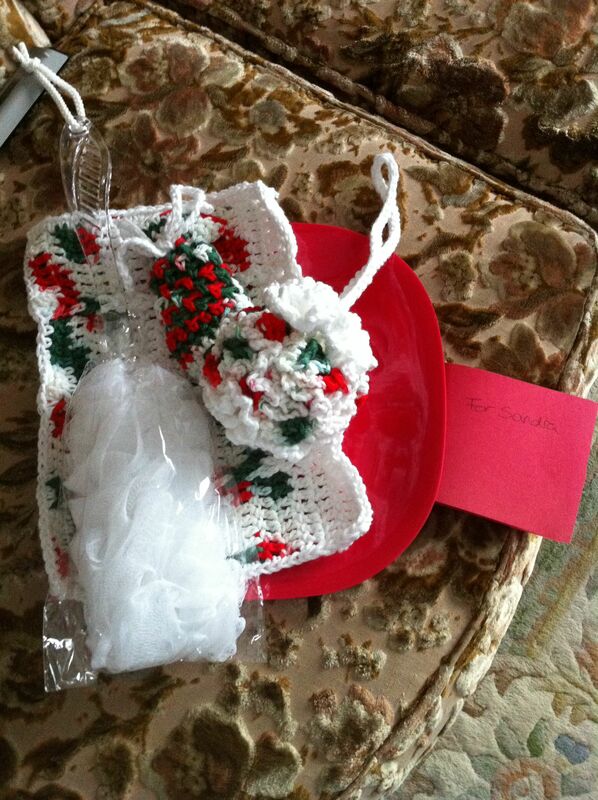 A red platter, topped with a back scrubber, a crocheted chain-8 dishcloth, a crocheted soap-saver bag with a scented bar of soap inside, and a crocheted bath puff, all wrapped up in cellophane and tied with a ribbon of red yarn. The chain-8 and bath puff are the standard patterns I’ve been using for years, and are linked from the projects on my Rav pages. The soap saver I just made up on the spot, and is basically just a sc1-ch1 pattern around, with a drawstring near the top. All was done with 2 shades of holiday Bernat Handicrafter cotton, plain white Handicrafter, and a 4mm crochet hook. 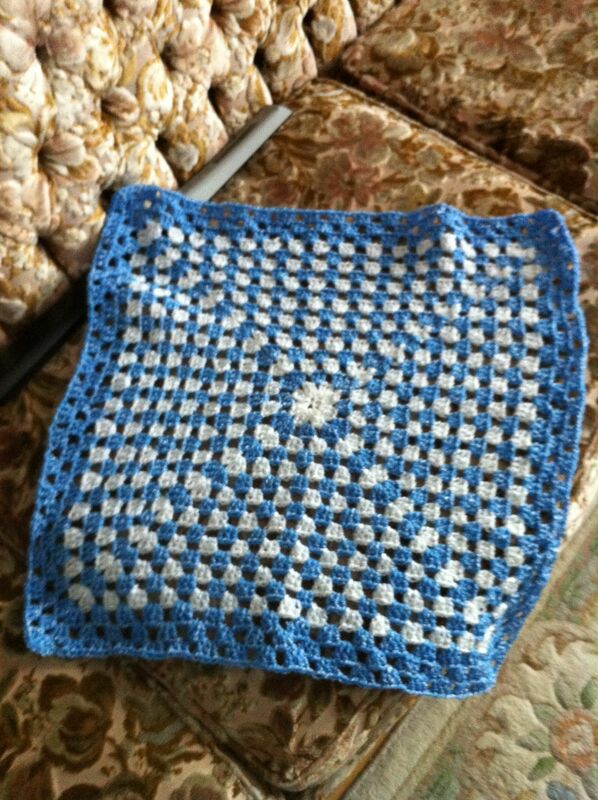 It’s 2 shades of Bernat Baby Coordinates from my stash, worked in a simple granny square, using a 4mm crochet hook. I would have liked to have gone bigger, but it was late, she was leaving on mat leave the next day, and my hand was starting to cramp into a claw. Categories: Crochet, FO, Food, Gifts | Tags: 5-Piece Bath Set, baby knits, cakes, Christmas gifts, Henri's Diego and Dora Cake, holiday, Paola's Granny Square Blankie, Teacher gifts | Permalink. It’s 3:30pm. I’ve completed 5 bath puffs and washcloths, and have to crochet 5 soap saver sachets and a baby blanket by tomorrow morning. None of which are started yet. And I’m maybekindasorta high on pain killers (I’ve got strep AGAIN) and I’m also mildly allergic to them so I have to keep stopping to scratch. Woooooo……. 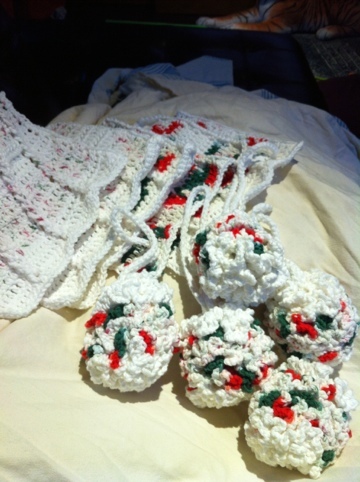 Categories: Crochet, FO, WIP | Tags: 5-Piece Bath Set, Christmas gifts, Teacher gifts | Permalink.